While April showers may bring May flowers, you can’t simply rely on showers alone. If you want your summer lawn to be a work of art, you gotta set it up to succeed in the spring. 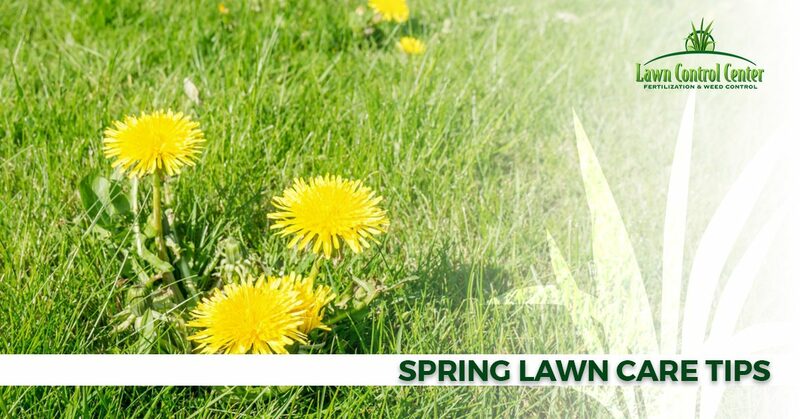 Below are some simple spring lawn care tips to keep in mind. If you in need of Columbus or Cleveland lawn care services, contact the Lawn Control Center today—888-833-6205. For those who love lawn care and lawn maintenance, it can be hard to not start preparing your lawn the first warm sunny day you get. However, it is important to give your yard time to thaw and dry out before you start. Foot traffic on wet soil can cause compaction problems, and it can inadvertently kill off new shoots before they mature. After an Ohio winter, there will most certainly be some debris left on your lawn. Begin by gently cleaning and raking all of this up. While you are at it, you may also want to prepare all of your lawn care equipment as part of your clean up. This includes changing the oil and sharpening the blades of your lawnmower. exactly to apply this weed control can vary, but as a general rule, you want to wait until the soil reaches a constant 55 degrees Fahrenheit. As long as the ground is not frozen or too wet, you can begin to reseed cool-season grasses. Once the ground begins to warm up, the seed will germinate before the scorching heat of summer bears down on it. While fall is the better time to reseed, the spring can be good for filling in bare spots. Need lawn control help? We’ve got you covered! Our lawn care services include lawn aeration, fertilization, weed control, and much more. Contact us today by phone 888-833-6205 or through this online form to get your free quote or to schedule your services.